So you’re planning to buy a bike camera to record your rides? Not only I’ll share with you my top picks, but I’ll also share with you the important things to consider before you buy. Most of us don’t have a bottomless budget to spend on bike cameras. So it’s a fine balance in getting things right and prioritizing what you want in a bike camera that suits your needs, while not breaking the bank. Here are 7 of my top bike camera picks. 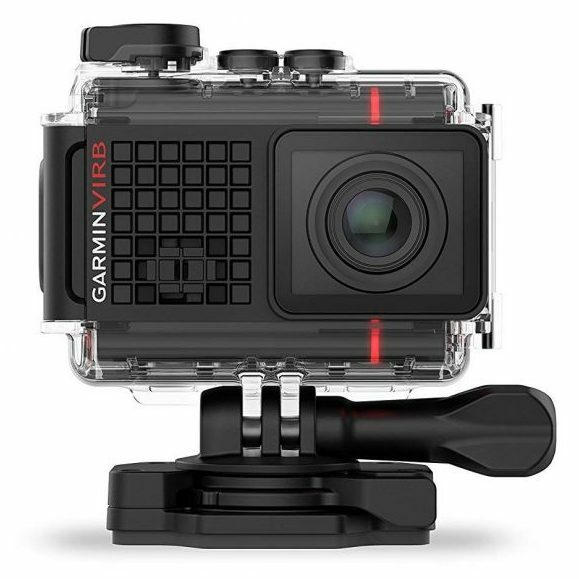 The Garmin VIRB Ultra 30 is my best overall camera pick as it is capable of up to 4K video, has image stabilization built in, has hands-free control, GPS and other sensors to measure speed and altitude and has a microphone to add the audio to the video. The unit is small and light enough for helmet or frame mounting and doesn’t stand out too much. The usability is pretty good too. You can use the built-in screen to adjust settings, view video or stills and control most aspects of the camera. It isn’t cheap but it’s probably the best for cycling as it comes with a built-in GPS. If you’re on a tight budget, then consider the Spy Tec Mobius Action Camera. Even though it is a budget camera, it still packs in the features. It shoots in 1080p HD at 30fps, has an ultrawide angle lens with 131 degrees of view, it can record on a loop, has low-light shooting ability, is light and can be drone mounted too. The unit is small and light and weighs only 1.37oz. It’s so light that even if you mount it on your helmet, the weight is almost imperceptible. 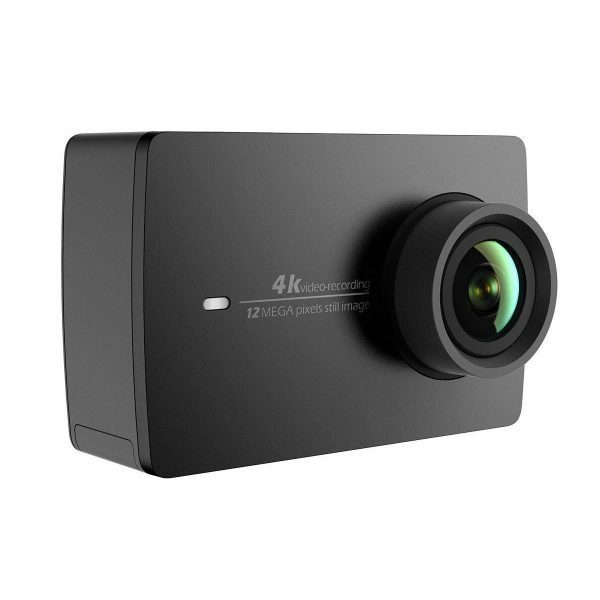 The YI 4K Action and Sports Camera balances affordability with features. As the name suggests, this action camera is capable of 4K video at 30fps, 1080p at 120fps and 12MP still images. With video stabilization built in, a neat touchscreen, hands-free operation with voice command, Bluetooth and a ton of other features, it sure packs in the features. The camera is small and light and comes with a Gorilla Glass Retina touchscreen. With Bluetooth and WiFi and a bunch of purchasable accessories, this camera is hard to beat at its price range. The GoPro HERO5 Session is the smallest camera in this list yet doesn’t compromise on quality or features. This action camera delivers 4K video and 10MP still images, is waterproof up to 33 feet, has voice control, video stabilization, simple touch controls and both WiFi and Bluetooth. That’s a lot packed into a tiny chassis that weighs next to nothing. 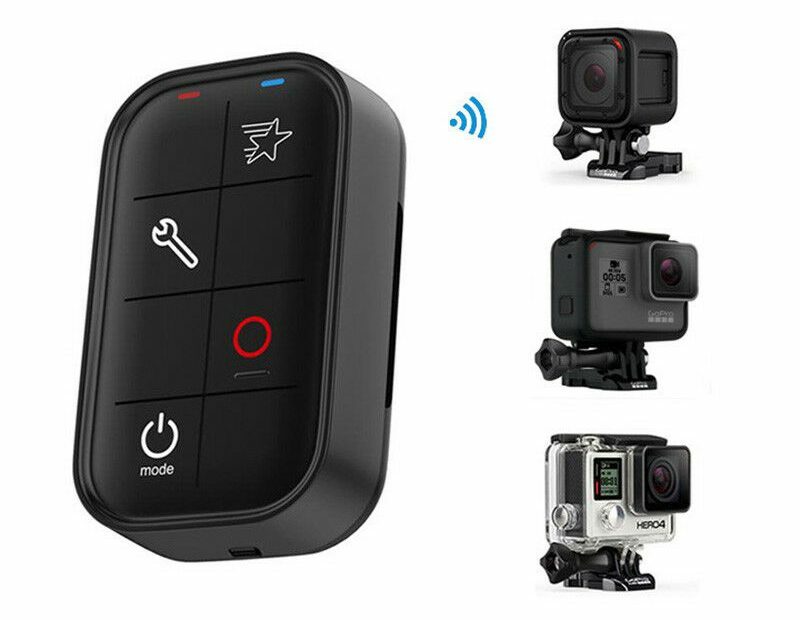 This being GoPro, the list of accessories is long and includes just about everything you could possibly need. 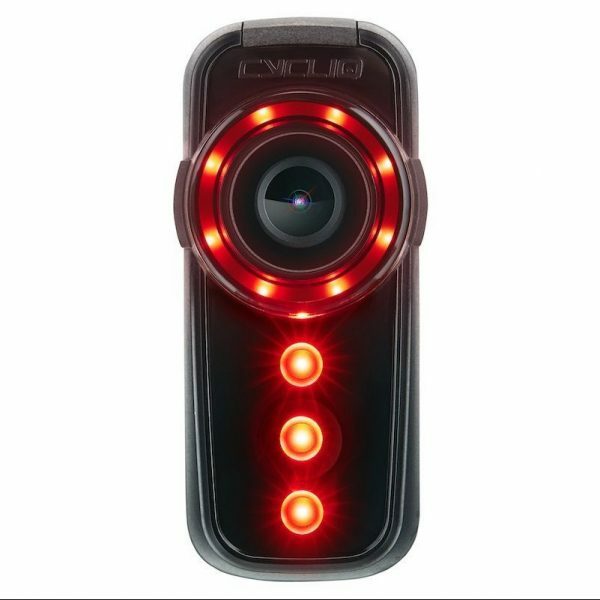 The Cycliq Fly12 is my choice for a bike camera with an integrated front light. It has improved massively over the previous model and is now an excellent option for cyclists. 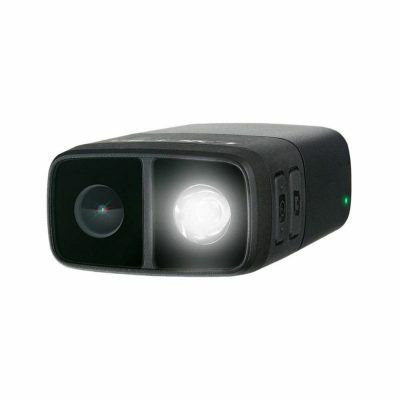 The integrated front light ensures you are seen while on the road as well as lighting the shot for the video. With 1080p capability, image stabilization, ANT+, Bluetooth and USB-C compatibility, it is a very versatile unit. The quality of the build is excellent and it weighs only 7oz. With an estimated runtime of up to 8 hours, longevity for longer rides isn’t an issue. It isn’t the cheapest option but the ability to combine front light and camera offers lots of scope. The Cycliq Fly6 is the companion to the Fly12 but this time with integrated rear light. If you want to keep an eye on what’s behind you, this is the bike camera to get. 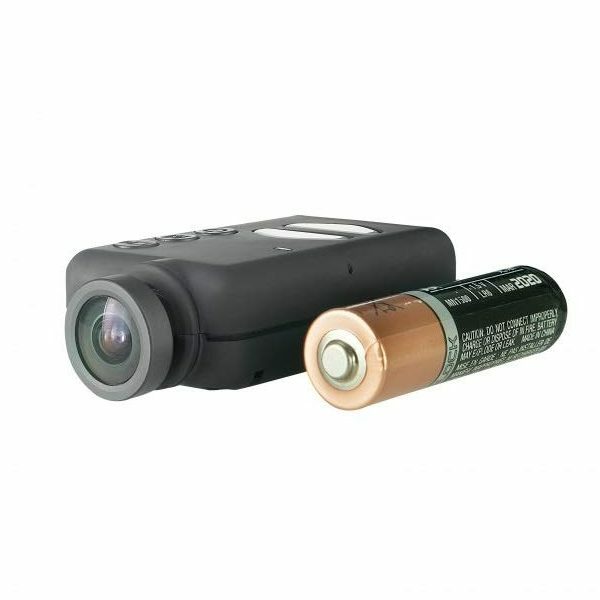 The camera is capable of 1080p at 60fps, has an ultrawide viewing angle of 135 degrees, image stabilization, 7 hour battery time, looping video option, bike alarm and more. The unit has the same build quality as the Fly12. It’s slightly smaller and lighter at 4oz and has the same ANT+, Bluetooth and USB-C compatibility. The GoPro Hero 7 is here because of its 4K video quality. A couple of other action cameras in this list are capable of 4K video but not with the quality of this. The camera is ideal for cycling, has image stabilization, hands-free operation, 12MP and HDR for still images, live streaming feature, time lapse, slow motion and lots more. The unit is small, light, waterproof and rugged enough for any kind of weather you’re riding in. At only 4oz, you will soon forget it’s there and with Bluetooth and WiFi, it has it all. The more advanced something gets, the more complicated it becomes to choose between competing versions. Nowhere is that more true than in cycling cameras. With so many models from so many manufacturers, it will take a while to choose between then all. 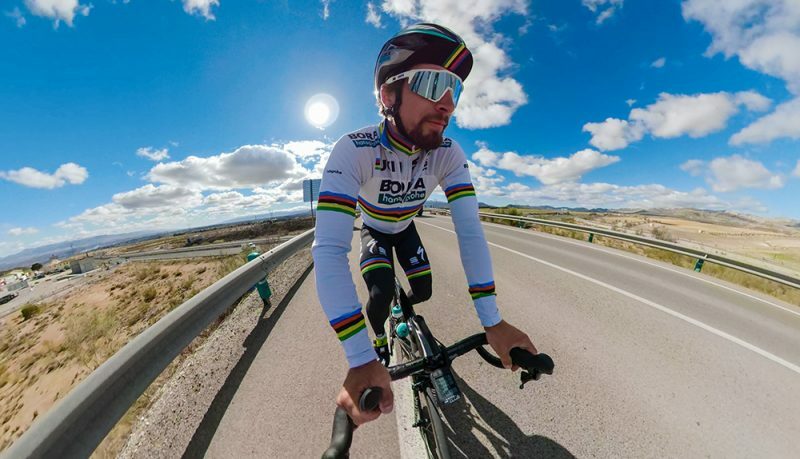 Even with this list of the best action cameras for cycling, your research is not done. What follows are some key features of action cameras. Most are vitally important to the user experience while some are nice to have. Here are 11 things to consider before buying your next bike camera. Typically, the more expensive a camera is, the better the image quality. The minimum you would expect of a modern action camera is 720p but it is entirely reasonable to set a minimum of 1080p. All of the cameras in this list are capable of 1080p as a minimum. UHD, or 4K is also available but only worth specifying if you have a 4K monitor or TV to play it back on. As most of us watch our footage on a smartphone or laptop, 1080p is a practical option for most users. If you do have 4K kit or want to future-proof your camera, 4K is the gold standard right now. One such example is the GoPro Hero 7. If you ride for longer periods, you may want to skip 4K for now as it has a detrimental affect on battery life. As 4K requires more processing power to record, the battery has a lot more work to do. If you’re going to be out on your bike for a while, reducing resolution to HD might be the order of the day. The other side of video quality is frames per second, or fps. This is a measure of how many frames the camera can handle each second. A practical minimum is 30fps as this is the speed of many TVs. Higher fps, such as 60fps in some of the cameras here offers a much smoother video with less blurring. Image quality is also important if you want to take stills with your camera. Video is great but sometimes it doesn’t tell the whole story. Some action cameras don’t take stills while others do. It isn’t their primary function so the camera won’t have many of the features of a smartphone or dedicated camera. 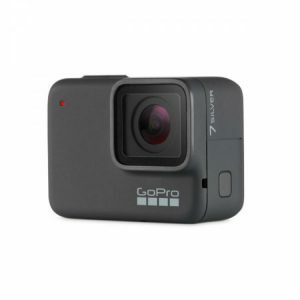 GoPro have a stills camera and the two in this list are capable of 10 or 12 megapixels (MP). That’s plenty enough for an action or landscape shot! PRO TIP : Aim for bike cameras with at least 1080p and 30fps capabilities. Image stabilization is a feature on most action cameras we use for cycling. The technology will use either gyro image stabilization or optical image stabilization to even out the video to make it smoother and remove some of the jerky movements you may endure while out on your bike. The gyro uses an electronic movement sensor to eliminate camera shake while optical stabilization movers the lens to counteract the movement. Neither is better than the other though. If you ride rough roads or trails, some kind of image stabilization can make the viewing experience a much smoother affair! PRO TIP : Image Stabilization will ensure you get to record better videos while cycling. You may notice field of view being mentioned in some camera descriptions. The Field of View (FoV) is measured in degrees from the front lens. So an FoV of 140 degrees means the camera will pick up the image 70 degrees either side, up or down from the lens. Field of view can impact the quality and immersion of a video by including more of the surroundings. If you are using your action camera for cycling safety, it will also include more of your surroundings and cover more angles of the road. PRO TIP : The wider the FoV, the more the video covers. Aim to have at least 120 degrees of view. Ease of use in the context of action cameras refers more to how easy it is to use the bike camera while on the move or while wearing gloves. Whether you’re turning the camera on or off, take a still image or make quick changes while on the bike, the buttons have to be easily accessible. Some action cameras come with hands-free operation or an optional remote such as those from GoPro. This can also mean simple voice commands can control the camera without your hands ever needing to leave the bars. If you think you might be adjusting your camera or will need to make changes on the fly, this could be useful. Otherwise, cameras are usually set and forget. Set your selected mode, set it to record and let it run until you finish. Battery life is a sticking point for most action cameras. The demand for smaller, lighter cameras with ever more detailed images means batteries are always going to be under pressure. Battery technology lags behind all technology right now so our options are very limited. You can reasonably expect battery life of between, 2 hours and 8 hours depending on how you use it. Most manufacturers give you an average expectation but don’t count on it. PRO TIP : Consider bike camera with user replaceable batteries if you’re planning for a long video shoot session when out riding. 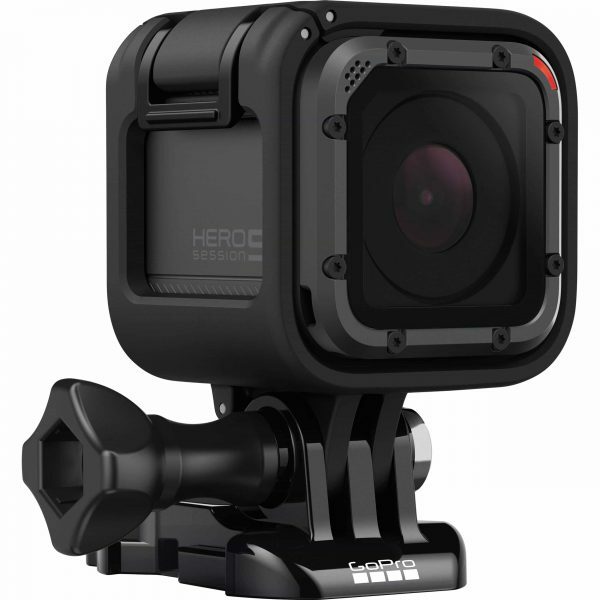 Some high-end action cameras include WiFi, Bluetooth, ANT+ or near-field communication (NFC). While not essential for normal operation, having these connectivity options enables you to watch or livestream your ride or connect it to other devices. WiFi, NFC and Bluetooth can connect your camera to your phone and from there to cloud storage or social media. ANT+ can connect your camera to bicycle computers, heart rate monitors and other sensors you may have on your bike. None of these are strictly necessary but if you have compatible accessories, they can offer another dimension to your movies. Whether you ride road or mountain, are a weight weenie or not, the size and weight of your camera will have an influence over the user experience. Firstly, size and weight can dictate where you mount it. Heavy cameras will not sit well on a helmet while larger ones may affect how comfortable you are using it. 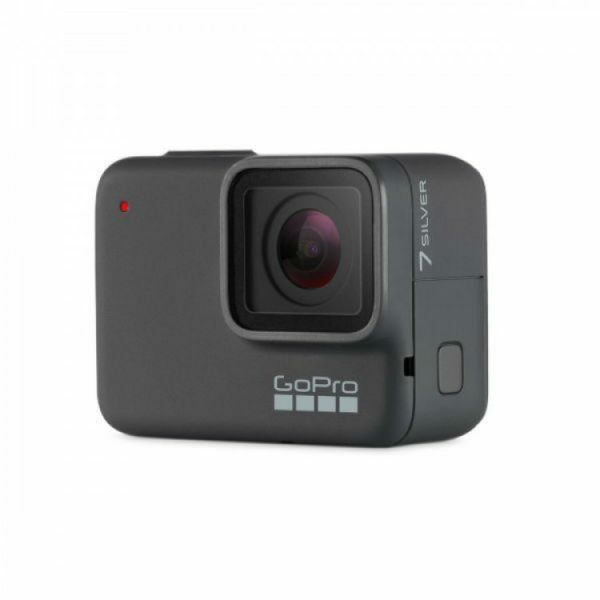 The GoPro Hero 5 Session is a good example of a small and compact bike camera. Frame or bar mounted cameras are less influenced by size and weight but you still don’t want a big, heavy camera making your bike look ugly. There are two main mounting positions for an action camera in cycling. Helmet mount offers a much more immersive experience for the viewer as the angle changes with your head and the POV is much more engaging. 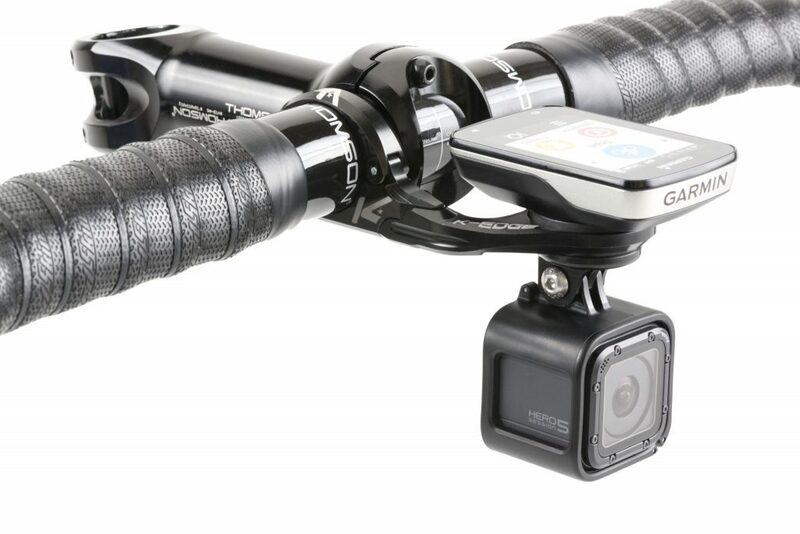 Bike or bar mount offers a less engaging but much more stable view. You may lose the shock absorption of your body but your view won’t move with every shift of your weight on the bike or pan the shot every time you look around. Mounting location comes down to personal preference. There are so many options out there for all kinds of camera that you can pretty much mount it wherever you like. Bike camera waterproofing is a value-add feature for cycling. Most bike cameras will survive a light splash or a little rain but need protecting from more. Some cameras are inherently waterproof and will come with a specific depth capability. The GoPro Hero 7 for example is waterproof up to 33ft. If the camera itself isn’t waterproof, you can buy waterproof cases as accessories. These will add weight and a little bulk but are often cheaper than spending the extra for a waterproof camera. GPS is another optional extra. It means the camera can geotag your stills and video and show exactly where you were when you recorded it. The Garmin Virb Ultra 30 has GPS built in and allows you to overlay some of that data onto your video. You can add speed, location or altitude to add another dimension to the video. If you have a compatible bike computer, you can sometimes overlay other data too. Use a Garmin Virb and a Garmin bike computer and you can add heart rate, temperature and other metrics to an overlay on the video too. Most bike cameras use microSD cards to store your footage. Some cameras can be finnicky about the cards they are compatible with while others will only work with limited sizes. Some cameras will not work with such large cards while others will. If you think you will be storing a lot of footage, from a multi-day event for example, using a larger microSD card is more practical than carrying multiple cards in your jersey pocket. As you can see, there is a lot to choosing action cameras for cycling. At least now you should have a good idea of some of the best around right now and what to look for when doing your research! 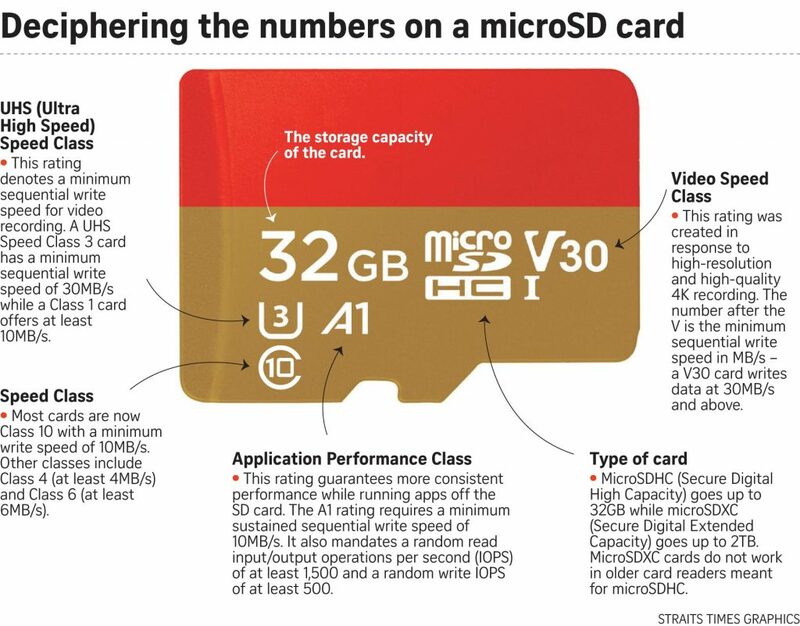 PRO TIP : You’d want a Class-10 microSD card at sizes around 128GB and above.